How many times in life does someone ask us to do something and give no indication of what they expect? Rubrics give a candid outline not only of expectations, but of possible outcomes that are each ranked. Gone are the days of unexplained grades on essays or assignments. At last qualitative and quantitative measurements align! 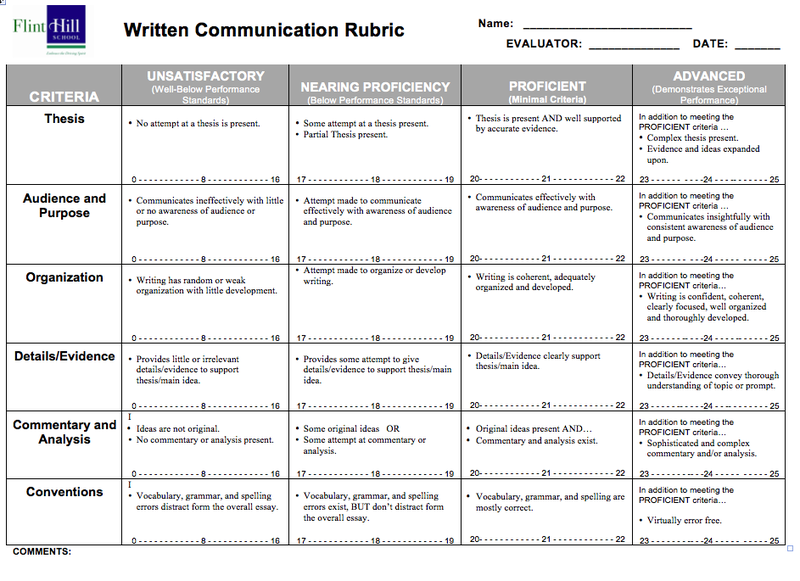 Below is an example* of a rubric for Written Communication. In a given assignment, not all criteria (at left) need apply. The verbiage within each cell corresponds to a numeric score at its bottom. Note that the words are more important than the numbers, but the numbers allow for traditionalists to keep grades in number and letter format, rather than restricting solely to qualitative language. Call it a hybrid scoring system. *The design and structure of this rubric come from the New Tech Network and New Tech High School.